This is another stout hybrid yarrow. 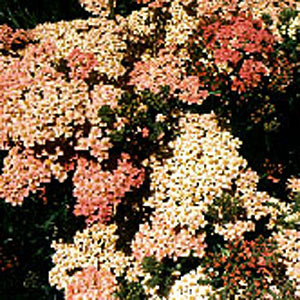 The flowers are a beautiful salmon-pink color when fresh, but they do fade a bit too much to be used as dried flowers. Beautiful in the garden. Also sold as 'Salmon Beauty'. Spreads by underground rhizomes. Categories: All Items, all potted plants, butterfly nectar plants, deer resistant, fire resistant plants, Potted Plants, More..